The special characteristic of the semiconductor strain gauge is the high sensitivity, offering gauge factors of 5 to 200. Their response is nonlinear. They are sensitive to temperature variation, The gauge is made up of semiconducting material. The constructional details of uniaxial and rosette strain gauges are shown in Figure. The constructional details of the gauge elements depend on the strain to be measured. That is whether it is uniaxial, biaxial or multidirectional. For uniaxial working narrow and long elements are used. For multidirectional working rosette gauge elements are available. The capacitance transducer which is nothing but a capacitance microphone is used for measuring the pressure in vacuum. 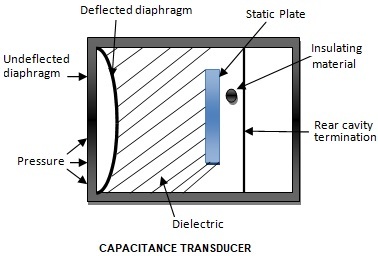 The constructional details of capacitance transducer are shown in Figure. The constructional details of the condenser microphone are shown in Figure. A stretched metal diaphragm is mounted near a metal electrode. This is the fixed electrode or static plate. There is a physical separation between the diaphragm and the fixed electrode. That is both are insulated from one another. The unit is usually housed in an air tight aluminium casing. An air cavity is provided on the rear side as shown in figure. The contacts from the diaphragm and the fixed electrodes are terminated over an isolated tag on the body of the microphone. A protective cover is provided over the diaphragm side. The capacitance offered by this type of microphone is of the order of 0.0003 µF. Changes in pressure vibrate the diaphragm. That is they displace the diaphragm from the static position. As the diaphragm and the static plate are separated by the dielectric [Air], when the diaphragm is displaced from its static position in the thickness of the dielectric changes. As the capacitance is inversely proportional to the thickness of the dielectric, there will be change in the capacitance. This change in capacitance is proportional to the pressure variations. The change in the capacitance can be measured. So the pressure variation can be know in terms of the capacitance. 2. It requires advanced and complex design for practical use. The inductive transducer is used in the measurement of force. The change in the inductance ratio of a pair of coils or by the change of inductance in a single coil indicates the magnitude of force. A ferromagnetic armature will be displaced by the force under the measurement. The force under consideration varies the reluctance of the magnetic circuit. 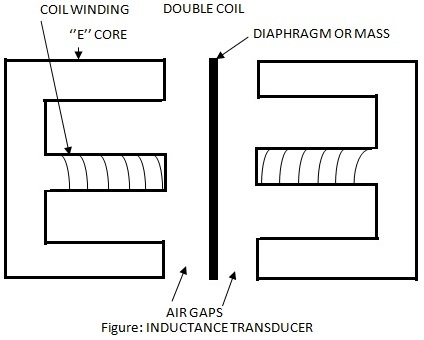 The Figure shows an inductance transducer. The double coil arrangement and single coil arrangement are shown in figure. The diaphragm, or armature will be displaced by the applied force. This causes variation in the reluctances of the magnetic circuit. The change in value of inductance with and without displacement of the diaphragm or armature is a measure of the applied force.